1/4 seam allowance-A 1/4 seam allowance is a 1/4 inch of fabric between where your seam begins and the raw edge of the fabric. A quarter-inch allowance is used by quilters for most projects. Having an accurate seam allowance is necessary for making pieces that align properly when you assemble the quilt. Many sewing machines have settings or 1/4" presser feet to help you sew with an accurate seam allowance. If you don't have a 1/4" foot, using colored tape to mark the correct allowance on the throat plate of your machine can help you see the proper allowance more clearly. 1930s reproductions- 1930s reproductions are quilting materials produced today using patterns popular during the 1930s. Using 1930s reproductions can help you create a vintage or antique look while still using new, more easily sourced material. 1930s reproductions are also handy for repairing heirloom quilts or finish quilts that have been handed down in-progress. Some popular 1930s reproduction prints feature muted florals, small animals, fairies, and Art Deco inspired designs. 4-Patch- A 4-Patch is a basic quilt block design, made by seaming four squares of fabric together to create a larger square. A 4-Patch is a building block of many quilts and can be made using two, three, or four pieces of fabric. 4-Patches are especially good for de-stashing projects or beginners' quilting projects. 9-Patch-A 9-Patch is a basic quilt block design, made by seaming nine squares of fabric together to create a single, larger square. The squares of fabric should be the same size as each other, but you can use a variety of colors and prints to create a unique quilt patterns. Advanced- Advanced quilting techniques include needle turn applique work, curved piecing, feathers, complicated free-motion quilting. 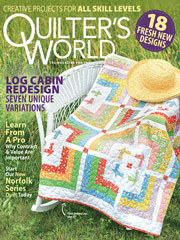 Advanced quilters may also be ready to design their own quilts or work free-hand on more complicated designs. Applique- An applique is a small decorative piece added to a quilting block or a completed quilt. For example, an applique lamb could be added to a baby's quilt or applique patches can be incorporated into individual blocks of a quilt. Appliques can be applied to quilts in several ways. Traditionally appliques are sewn to quilts by hand or using a machine. For a raw edge to the applique, the applique can be fused to the quilt before sewing the applique, leaving the edge raw for added texture. Other methods include reverse applique, needleturn applique, starch applique, or bias appliques. Backing- When you are finished piecing the top of the quilt, adding a quilt backing creates a finished product. A quilt backing is a large piece of fabric seamed to the top of the quilt. The backing can be one seamless piece, or made of two or three strips of fabric seamed together. The backing holds in the quilt batting and covers the seams that hold the quilt blocks together. A quilt backing may be made from solid or printed fabric. When preparing your quilt backing, the backing should be larger than the top. Sturdy fabrics such as muslin, cotton, or linen are excellent for backing. Basting- Basting serves to temporarily hold the top, batting, and backing together while you sew the quilt together. Basting can be done manually with pins, temporary basting stitches, fusible materials that hold the fabric together when ironed, or with basting sprays or gels. Basting keeps the parts of your quilts flat and aligned so that the quilt comes out evenly when you sew it together. Batiks- Batik fabric creates beautiful, colorful quilts and blocks. Batik fabrics originated in Indonesia and features intricate designs and bright colors. Traditionally, batik prints were made by applying wax designs on high thread-count cotton or silk so that when the fabric was soaked in dye, the wax-treated places would be left undyed. Often batik fabrics feature floral or geometric shapes made from the arrangement of small dots. Today, batik prints are featured in a variety of world cultures and can be used by quilters to create color-saturated squares and patterns. Batting- Batting is the layer of fiber between the backing and the quilt top. Batting offers warmth, softness, and texture to the quilt. The type and amount of batting helps determine the thickness, stiffness, and drape of the quilt. Cotton batting, for example, offers softness and durability. While wool batting tends to hold the quilt's shape and offer warmth, polyester can give more loft or thickness to your quilt without added weight. Batting can be purchased in standard sizes to make twin, queen, or king size quilts or you can cut batting to fit your own project size. Beginner- An easy project suitable for a quilter just starting out. To build quilting skills, good beginner skills include basic seaming, 4-Patch squares, and other simple piecing projects. Betweens- A betweens needle, or quilting needle, is a needle for hand sewing quilts. Typically, betweens needles are short and thick so they can move easily through multiple layers of the quilt. Betweens needles usually come with small eyes, but you can buy larger eyed betweens needles for easier threading. It's recommended that beginning quilters start with smaller needles, such as a size 8 or 9 and as they get better at creating short, even stitches they can move up to slightly larger needles such as 11 or 12. Bias-See also, bias binding. Cut on a 45 degree angle. Bias Binding- A bias binding is a type of finishing that uses a strip of fabric called bias tape to surround the raw edge of the quilt. Bias tape is made from a strip of fabric folded in halfwith the sides folded inward so that the edges of the fabric are on the inside of the fold, creating a crisp border. A bias binding is sewn by inserting the edge of the quilt into the bias tape and sewing it in place. Because the edge is thus encased in two layers of fabric, a bias binding makes a durable and polished finishing to a quilt. Bind- To bind a quilt is to sew the quilt's binding, typically the last step in sewing the quilt. See also: binding. Block- A block is a basic unit of a quilt. Many quilt patterns are made up of a specific number of blocks, which are created as individual pieces and seamed together to form the finished quilt. Quilt blocks come in a variety of patterns and designs that can be repeated or mixed and matched in sewing the finished quilt. Borders- Borders are strips of fabric that frame the outer edges of the quilt. Whereas the binding serves to hide the raw edges of the quilt, the border may add an extra decorative finish. Although borders usually refer to the edges of the whole quilt, individual quilt blocks may have borders as well. Borders come in different styles including squared corners, which feature straight edges along the sides, top and bottom, and mitered corners, in which the corners meet at a diagonal or bias. Button hole stitch- Sometimes called blanket stitch. A button hole or blanket stitch is used to edge a blanket or felt piece with a raw edge. The stitch can also be used to add texture in embroidery or to attach an applique. The button hole stitch looks like loops along the edge of the fabric, creating a border. Chain Stitching- Chain stitching or chain piecing refers to the practice of stitching squares or blocks with one continuous length of thread rather than breaking between pieces. Chain stitching saves quilters time by making their sewing more fluid and streamlined. When sewing multiple blocks at once through chain stitching, a thread will string the blocks together. This thread can simply be trimmed to separate the blocks and allow you more flexible piecing of the quilt. Charms- A charm quilt is a type of scrap quilt in which no scrap of fabric is repeated in the quilt. The charm quilt has been a popular project since the 1800s, so a wide variety of charm quilt patterns exist. Charm quilts can be sewn with scraps of fabric leftover from other quilting projects or using charm packs-bundles of assorted fabrics. Civil War Reproductions- Civil War Reproductions are fabrics produced today based on prints that were popular during the Civil War. Civil War Reproductions may also refer to patterns designed after the styles of quilts popular during the Civil War, particularly featuring Log Cabin and starburst style blocks. Clamshell- A clamshell quilt features circles of fabric that are pieced together overlapping each other in a scalloped design. Clamshell quilts are good projects for practicing curved piecing and for showcasing a variety of fabrics. Making clamshells may be made easier with a curved sewing machine foot or a fabric die-cut for cutting the fabric. Confident Beginner- A confident beginner may be competent in basic hand sewing or sewing machine operation. Confident beginners may be ready to begin with more complicated piecing or applique projects. Coordinates- Coordinates refers to quilted pieces meant to go together. For example, coordinates may include a bed quilt and pillow shams. The term may also refer to fabrics that coordinate with each other and can be mixed and matched in creating quilt blocks. Cross Grain-The cross grain of fabric refers to the threads that run perpendicular to the length of the fabric, stemming from the selvedge edge (the finished edge) of the bolt of fabric. In quilting, cross grains are used in a cross grain binding, a common binding that offers slightly more stretch than a straight grain binding.To sew a cross grain binding, cut your binding strips along the cross grain of the fabric. Cross Hatch- Cross hatching is a type of stitching pattern sewn over the top of the quilt to add texture to the design. The cross hatch is achieved by sewing straight lines across the entire quilt at regular intervals (for example, every 2 inches) in one direction and then repeating the process running perpendicular to or at a bias from the first set of lines. This process creates small boxes or diamonds over the surface of the quilt. Curved Piecing- Curved piecing uses fabric pieces cut in circles or curves as part of quilt blocks or as the blocks themselves. Curved pieces can be concave (with the curve cut into the fabric) or convex (the fabric cut with a curved edge, as in a circle). Curved piecing is a component of many advanced or traditional quilts and can be used to create starbursts, fans, clamshells, and many other patterns. A rotary cutter and a curved piecing foot may be used to make curved piecing projects easier. Cutting Mat-A cutting mat is a sturdy, flat surface marked with measuring lines to make cutting fabric, paper, and other materials more accurate while protecting your tables or other work surfaces from blades or rotary cutters. A self-healing cutting mat does not get permanently marred by your blade as you cut the fabric. Many cutting mats also provide a bit of traction to keep the fabric from sliding as you cut. Dog Ears- Dog ears are the extra bits of fabric that show up at the corners of a quilt block when two triangular pieces are seamed together. Dog ears are the result of a diagonal seam and should be trimmed before finishing the quilt block. Drunkard's Path-A Drunkard's Path is a quilt block created from sewing a concave curve to a convex curve. There are over 80 different patterns combining drunkard's path blocks in different arrangements.Â Often, the two curves of the Drunkard's path are cut from different colors, creating the visual complexity of the piece. Because of its multiple curves, a Drunkard's Path is a more advanced quilt block to sew. A template can make cutting the curves easier. Echoing- Echoing, or echo lines, are lines of stitches sewn at close, regular intervals around an object or shape on a quilt to add texture or to fill space between objects on a quilt. The echo lines follow the shape or curve of the object, emphasizing the negative space around the shape. Echo lines are often sewn by hand in a color of thread that matches the fabric the lines are sewn on. In this way, they add texture without necessarily adding color. Echo lines can also be used to create the motif of a quilt on their own, when they are sewn from an embroidered shape rather than from an applique or other quilt component. English Paper Piecing- In English Paper Piecing, a quilt block is created from pieces sewn around paper patterns. While hexagons are the most popular shape in this pattern, many other shapes and designs can be used. The paper pattern stabilizes the fabric and helps with precision, making English Paper Piecing a good technique for designs that feature many corners or other details. English Paper Piecing is usually completed by hand, as the quilter wraps the fabric around the paper template and sews the edges together. Once the shape has been whip stitched together, the paper template is pulled out. Fat Eighth- A fat eighth is a 1/8th of a yard pre-cut piece of fabric measuring 9x22 inches.Fat eighths are a good way to sample fabric collections and create a stash for a scrap or charm quilt. Fat Quarter- A fat quarter is a piece of fabric measuring 18" x 22". Fat quarters are a standard measurement for sampling fabrics or collecting fabric for a scrap or charm quilt. A fat quarter can be cut into 12 5 inch charm pieces. Featherweight- A Featherweight is a popular Singer sewing machine commonly used in quilting projects. The Featherweight machine is light and portable but sturdy for completing many quilting projects. The Featherweight was produced from 1933-1964 but were so popular and widely distributed that many are still available on the market and can be purchased, serviced, and used. Featherweight machines are typically used for smaller piecing projects rather than for finishing full quilts. Feathers- Feathers are a feather-shaped embroidered finish on the top of a quilt. Feathers are essentially made from a spine around which teardrop or semi-circular ridges are sewn. Feathers can express the particular style or skill of the quilter as they are often sewn by hand using a hoop, needle, and thread. Feathers can also be sewn using a long-armed machine or with free-motion quilting supplies. Feathers are used to add texture to the design of a finished quilt. The design of feathers can vary from simple flourishes to more intricate plumes depending on the preference and skill of the quilter. Feed Dogs- On a sewing machine, feed dogs are metal teeth that rise out of the throat plate. The feed dogs grip the underside of the fabric, helping to pull it through the machine and away from the needle. While feed dogs help your sewing projects progress, for darning projects or freehanding projects such as appliqueing or sewing feathers, the feed dogs should be turned down or covered so that the quilter has more control over the speed and direction of the fabric. Feed Sack- Feed sack or feedbag quilts were created from cotton sacks used to package dry goods and other commodities, particularly during the Great Depression. In the mid-1800s, many companies began transporting grains and feed in cotton sacks, many of which featured circular logos and other designs. Once the products inside the sacks were used, many women would use the sturdy cotton fabric in their quilting projects. This practice continued well into the 1960s. Capitalizing on the women's thriftiness, many companies started to market their goods by producing feed sacks with more intricate prints. Today, making feed sack quilts is a popular way to tap into quilting traditions as feedsacks are available through vintage shops and reproduction fabrics recreate the prints popular during the Depression. Felted- Felted wool is created by running wool fabricâ€”fabric that is woven from wool yarn or threadâ€”through hot water with a wool-only detergent. The hot water and agitation causes the wool to mat together, creating a sturdy felted material. Felt can be created this way from knitted pieces that are at least 80% wool. Once the wool is felted it can be used in your piecing projects or as appliques. Flying Geese- Flying geese is a traditional quilt block pattern created from sewing a triangle at each end of a rectangular base so that a peak is formed at the block's midpoint. The rectangle can subsequently be trimmed to fit into a square block pattern. A finished Flying Geese block looks like stacks of triangles, reminiscent of geese flying in formation. Flying geese are typically used as accents or borders to quilts, but can be used for an entire quilt pattern. Fusible Applique- See also: applique. A fusible applique is applied to a quilt or other finished piece using a fusible backing. The fusible backing is made of a web that becomes sticky when heated with an iron. For pieces that will not be worn or see daily use, such as a table runner or a wall quilt, a fusible applique can be a quick and easy alternative to a more traditional applique method. Fussy Cut- Rather than cutting fabric simply based on yardage or other measurements, a fussy cut is used to capture a particular part of the fabric in order to showcase an element of the pattern. For example, if a fabric has a complicated print, a fussy cut can be used to isolate and cut out a particular part or image in the print. When doing a fussy cut, quilters should remember to still leave the seam allowance used for the project. Grandmother's Flower Garden-Grandmother's Flower Garden is apopular and traditional quilt pattern made using clusters of hexagons to create flowers. A Grandmother's Flower Garden quilt top often uses English Paper Piecing to form the hexagons. The entire quilt may be pieced together with hexagons or hexagons may be used just to create flowers that can be attached to square quilt blocks. Half Square Triangle- (HST) Also called triangle squares, half square triangles are a simple and common patchwork component made from seaming two triangles together along the base/bias to make a square. Half square triangles are handy for scrap quilts and can be used as individual blocks or as parts of more intricate block designs. Hand Applique- See also: applique, needleturn applique. Using an applique needle or a betweens, a hand applique involves hand sewing pieces of fabric together to create designs or images on a background square or quilt. Hand appliqueing is often used with a Grandmother's Flower Garden pattern, for example. Hand Quilt- Hand quilting is the process of sewing together the elements of the quiltâ€”the blocks, seams, and bindingâ€”by hand using a quilting needle or a betweens. Hand quilters often use quilting frames or hoops to stabilize their work. The finish of a hand quilt is softer and looks more traditional. Intermediate- An intermediate quilter may have mastered more skills than a beginner or novice but still not be ready for advanced quilting techniques. Some intermediate quilting skills include simple free-motion quilting, piecing, and needleturn applique work. In-the-ditch- Stitching in-the-ditch is a method of sewing the quilt together that minimizes the appearance of stitches on the quilt top by sewing the quilt together in the seams created by piecing quilt blocks or applique components together. For stitching in-the-ditch quilters often choose "invisible" thread, which resembles fishing line, or a thread that matches the background of the quilt. Layer Cake- A layer cake is a bundle of 10" squares of assorted fabrics, usually including around 40 squares per layer cake. Layer cakes are an affordable way to collect a variety of fabrics or coordinating patterns for scrap quilts or charm quilts. Pieces of the layer cake are easily used in 4-Patch and 9-Patch blocks. Loft- Loft describes the thickness of the batting of the quilt and, by extension, of the quilt itself. High loft refers to a quilt with thick batting and therefore a fluffier appearance. Low loft refers to thinner batting, often resulting in a lighter quilt. Longarm Quilting- Longarm quilting uses a long-armed sewing machine to stitch together the quilt top, batting, and backing. The arm is typically 10 to 14 feet long and can be used to finish quilting projects more quickly. When using a longarm quilting machine, the quilt may not need to be basted before sewing the pieces together. Machine Quilt- A machine quilt is a quilt sewn using a sewing machine to piece together the blocks as well as to sew together the quilt top, batting, and backing. As opposed to a hand quilt, the stitches may have a more even and precise finish. Machine Quilting- Machine quilting involves using a sewing machine to seam the pieces of the quilt blocks and to stitch together the quilt top, batting, and backing. A machine may also be used to do free-motion quilting if the feed dogs are lowered and the darning foot is attached. See also: longarm quilting. Marking- Marking is the practice of using utensils such as fabric mechanical pencils, washable pens, air soluble pens, chalk, etc. to mark the lines on which the quilter will cut or stitch. Marking can be used before cutting fabric for piecing patterns or before stitching seams, cross-hatching, or free-motion quilting patterns. Marking technique may vary from quilter to quilter as it simply serves as a guide to keep the quilter's work tidy and accurate. Meandering- See also: stipple. Meandering is a free-motion quilting technique, sewn over the top of the quilt to add texture without detracting from the appearance of your piecing. Meandering is stitched in a wandering line, covering the space of the quilt without following a set pattern. Meandering can follow the shape or style of the quilter's choice and tends to recede from the eye so the piecing of the quilt remains at the forefront. Medallion- A medallion quilt is a popular and traditional quilting pattern comprised of a center medallion surrounded by multiple decorative borders. To build a medallion quilt start with a center focal piece such as a patchwork block or an applique block and seam borders made from other blocks around it. For example, several flying geese blocks or 4-Patch squares can be used as a border. Mitered Borders- See also: borders. Mitered borders are constructed from border pieces that meet at a diagonal or a bias rather than at a right angle. When creating mitered borders it is suggested that the border pieces are sewn together first and then applied to the quilt. Monofilament thread- Also called "invisible thread," monofilament thread is made from clear nylon or polyester. Monofilament thread is often used to stitch in-the-ditch so that the seams on the quilt are subtle or hidden. Needleturn Applique- See also: hand applique, applique. A needleturn applique is created by hand sewing a design or image onto a quilt block or background. Start by cutting shapes out of fabric (allowing for your set seam allowance around the shape). Turn the seam allowance under as the applique is sewn to the background, in order to hide the stitches. Needle Turn- See also: Needleturn applique. Needle turn refers to the process of hand sewing an applique onto a quilt block or background. The needle turn technique uses a quilting needle or a betweens to hand sew the work rather than using a machine or a fusible method. Needles-See also: betweens. Needles are an essential tool in quilting, whether you are quilting by hand or using a machine. A hand needle is comprised of an eye through which the thread is inserted, the shank of the needle, and the sharp point for piercing the fabric. Most quilters use a needle called a between to do work by hand, as this quilting needle is short and thick, giving the quilter more control while still being able to penetrate all three layers of the quilt. Sewing machine needles come in a variety of sizes and metals to fit different projects and machines. Consult your machine user's manual to find the right needles for your machine. Nesting- Nesting is a technique for sewing seams on a quilt so that the seams line up with each other more precisely. Nesting seams works particularly well at intersections such as in a 4-Patch or 9-Patch. When sewing the seams, press the seam allowance in opposite directions to cut down on the bulk left by the seam allowance. Novice- See also: Beginner. A novice quilter is someone just starting out. Projects suitable for a novice quilter include 4-Patch and 9-Patch blocks and basic piece-working that can build up the novice's skills before she or he moves on to more intermediate projects. On-point- Quilts set on-point are designed so that, rather than having the blocks sit next to each other in straight lines, they are set on a diagonal with the blocks pointing up or to the side. This layout creates gaps on the sides of blocks that are filled with setting triangles. On-point quilts are a relatively easy way to make a basic patchwork quilt more visually interesting. Paper Piecing- (FPP) Also known as Foundation Paper Piecing. In paper piecing, the fabric pieces of the quilt are sewn directly onto a foundation paper (some quilters use freezer paper) that stabilizes the pieces and has stitch lines drawn on it to help the quilter achieve greater precision when sewing. Once the quilt block is pieced, the paper is ripped off the back of the block. Patchwork- A patchwork quilt is a quilt in which the quilt top is constructed from patches of fabric sewn into a design. There are a wide range of traditional and creative designs for patchwork quilts and this type of quilt is the most iconic quilting style. A patchwork quilt is constructed from the patchwork quilt top, a layer of batting, and a backing. Pattern- A pattern refers to the guided instructions quilters follow when making their quilts. Typically, a pattern includes templates, charts, and written directions detailing the steps for creating the quilt or quilt block. Patterns can help quilters learn new techniques and/or create a specific quilt design. Pebbling- Pebbling is a style of free-motion quilting used to add texture to the quilt top. When pebbling, the quilter stitches small circles, or pebbles, of varied sizes over the top of the quilt to hold the top, batting, and backing together. The pebbles can be stitched freehand or following markings made by the quilter. As the pebbles are stitched, they should connect with each other, creating one fluid motion rather than fully distinct circles. PFD- Prepared for Dye- Prepared for dye fabrics are fabrics, typically cotton, which are free of whiteners, starches, finishes, dyes, or sizing so they are able to better accept dye. PFD fabrics can be dyed to a specific color to match other materials or dÃ©cor with which the quilter is working. Piecing- In quilting, piecing is the process of creating quilt blocks by sewing together pieces of fabric in a pattern. Piecing can be as simple as sewing together squares of fabric for a 4-Patch or it may involve more complicated shapes and techniques. Precuts- Precuts are pieces of fabric that come cut to specific measurements. Precuts can be purchased in affordable bundles and are an easy way to purchase an assortment of different fabrics for use in quilts. Examples of precuts include jelly rolls and layer cakes. Many craft stores sell precuts at discounts to help clear remaindered inventory. Press- To press a quilt, iron the seam allowances as you stitch the blocks. Pressing the steam allowances keeps them neat and flat so that they do not accidentally end up stitched into a seam, distorting the pattern or creating bumps. Some quilters press the seam allowances to the side as doing so is believed to strengthen the seams. Others press the allowances open so that the blocks lay flatter. Pressing Sheet- A pressing sheet is placed between the fabric or applique and the iron, protecting the fabric from the high temperature of the iron needed for pressing or, especially, for fusing appliques or bastings. Pressing sheets can also be used with photo transfers, hot glue, and other adhesives to create a barrier between the iron and crafting materials and to make cleanup easier. Quilt-as-you-go- Quilt-as-you-go is a method of quilting in which the top, batting, and backing are sewn together as the quilt comes together as opposed to finishing the quilt top before attaching it to the batting and backing. Often, quilt-as-you-go quilts feature pieced backing instead of solid backing, allowing for more flexibility in the quilt design. Redwork- Redwork is a popular embroidery style that originated in America in the 19th century. It features embroidery stitched on a light background in a contrasting thread, typically in a bold red color. Redwork creates a classic look associated with American culture. Reverse Applique- In a reverse applique, the appliqued patch or image is sewn onto the wrong side of the fabric and the fabric covering the image is then cut away to reveal the applique. Reverse appliques can emphasize the stitching of the applique and create a more rugged look to the project. Rotary Cutter- A rotary cutter is a tool used to cut fabric and other materials with a round blade that spins as the cutter is pushed along the material. Rotary cutters are often used in conjunction with a cutting mat to create precise cuts for piecing and other projects. Rows- A quilt set of rows is arranged with blocks in horizontal rows. Generally each row features a simialr geometric pattern. Rows quilts are easy to design and are a good way to showcase a variety of block designs. A rows quilt is also a good project for a beginning quilter. Rulers- In quilting, rulers are used for a variety of steps, from cutting fabric pieces to checking seam allowances. A non-slip ruler can be a handy tool for a quilter as it makes it easy to measure fabric accurately without the fabric sliding on the ruler. Often, quilters use gridded rulers or cutting mats so that they can measure the width and height of a piece at once. Sandwiching- Sandwiching is the conversational term for assembling the quilt top, batting, and backing together for basting and to be bound together. Some quilters use large tabletops or quilt frames for sandwiching while others create the sandwich on the floor, pinning the backing to carpet or using a non-slip surface to keep the quilt sandwich in place. Sashiko- Sashiko literally translates as "little stabs" and is a decorative and reinfocing stitch that originates in Japan. Traditionally, Sashiko stitching is done in white thread on a blue background. It is often used to reinforce points of wear, like on a jacket shoulder, but is also used just for decoration. Sashiko embroidery comes in a variety of designs but typically features linear elements. Sashing- Sashing is a strip of fabric that runs between blocks on a quilt top. Sashing can create a windowpane look to a quilt, making each block stand out more. Often sashing is made from a white or pale fabric to help the colors of the blocks pop. Alternatively, sashing can be created in a contrasting color from the quilt blocks. Satin Stitch- Sometimes called a zig-zag stitch, the satin stitch is used to attach appliques. The satin stitch is built into most sewing machines and creates a clean edge to keep borders from unraveling. Satin stitch is also useful for attaching patches. Seam Allowance- The seam allowance is the width of fabric between where your seam begins and the raw edge of the fabric. A quarter-inch allowance is used by quilters for most projects. Having an accurate seam allowance is necessary for making pieces that align properly when you assemble the quilt. A seam allowance should be accounted for on pieces, full blocks, appliques, and quilt backings. Pressing the seam allowances as you quilt can help keep the allowances from getting caught in the seams or creating extra bulk. Sharps- Sharps are long, thin needles often used by quilters who hand stitch their piecing. Sharp needles are particularly good for for astraight stitch. Sharp needles are also needed for sewing with high thread-count fabrics such as Batiks. Stiletto- A stiletto is a pointed tool quilters use to help with precision and to protect their fingers when working close to a sewing machine needle. A stiletto can be used to move fabric through the sewing machine, to grip fabric more carefully, or to hold small seams open, among many other uses. Basically, a stiletto helps a quilter with small, detailed tasks that may be more difficult with one's fingertips. Skill Level-A quilter's skill level is characterized by the set of techniques at which he or she is most comfortably proficient. For example, while a beginning quilter may be able to successfully complete basic piecing projects, an intermediate or advanced quilter is able to do more complicated work such as curved piecing or free-motion quilting. As a quilter tries more techniques he or she can acquire new skills and advance to a higher skill level. Slip Stitch- A slip stitch is used to make an invisible seam between two edges. A slip stitch can be used on quilt bindings, to close a lining, or to apply an applique. One way of sewing a slip stitch is to fold down both edges. Run your needle through the fabric on one side of the seam and then through the fabric on the other side of the seam, running parallel. When you pull tight, the seam will close, with the folded edges coming together in a sort of kiss. Solids- Solids are fabrics that are just one color. Solids may be incorporated into quilt patterns and block designs or a quilt may be designed entirely from solid fabrics, drawing attention more to the overall design of the quilt than to the piecing of the blocks. Square Up- If after quilting, the sides of your quilt are uneven, you may need to square up. Squaring up is trimming the edges of the quilt (carefully) so that the measurements are even. If too much needs to be trimmed, it may change the proportions of the quilt and skew the pattern. Squaring up may also refer to the need for adjustments to a quilt block to make it fit into the quilt pattern. Individual quilt blocks may need to be trimmed or stretched so that they align with other blocks correctly. Double-checking measurements and keeping an accurate seam allowance is the best way to avoid squaring up. Stencils- Stencils are used for marking the stitch lines for hand sewn or machine quilts. Stencils can be used for adding markings to show the quilter where to cut or where to sew free-motion quilt designs, seams, or other quilting designs. Stipple- Stippling is a free-motion quilting technique used to add texture to a quilt top. Stippling is a basic quilting skill and serves as a simple filler design that blends into the background of your quilt. To stipple a quilt, stitch a meandering line that doesn't cross itself over the quilt top. The size and "waggliness" of your stippling will vary depending on the design of your quilt and personal preference. Straight Grain- The straight grain of the fabric runs parallel to the selvedge edge of the fabric and offers little stretch. Binding along the straight grain creates a sturdy quilt with little flexibility along the edges. Strip Piecing- At its most basic, strip piecing is a quilt top made from long strips of fabric seamed together. Strip piecing can also be used in more intricate quilt top designs. It is also possible to create new fabrics from strip piecing and then cut shapes from the strip pieced fabric to include the stripes of the strip piecing in more intricately pieced quilt designs. Subcut- A subcut is a smaller piece of fabric cut from material that has already been cut. For example, from a jelly roll or a fat quarter, a quilter may cut a smaller piece of fabric to use in piecing, a charm quilt square, or other design. Templates- A template is a piece of paper, cardboard, or other material that is used as an outline for tracing pieces to be cut for a quilt block, piecing design, or an applique. There are many kinds of templates to serve different needs. Often, a quilting pattern comes with templates for any shapes that need to be cut. Templates can also be created by a quilter from scratch. Thimbles- Thimbles are a quilting notion used to protect thumbs and fingertips from sharp needles. Usually a thimble is made from tin or another light metal and is shaped like a small cup that is placed over the fingertip. Thread-count- Thread-count is the measurement of the number of threads in a square inch of a woven fabric. The thread-count is taken from counting threads running along both the length and width of a fabric. Generally, the higher the thread-count the better the quality, durability, and softness of the fabric. Tonals- Tonals are fabrics for quilting or quilt patterns that feature designs or prints made from different shades of the same color. For example a tonal fabric may includea floral print in different tones of blue on a dark blue background. Tonal fabrics can be used within quilt blocks or as quilt backings. Trapunto- Trapunto means "to embroider" in Italian. Trapunto quilting adds a puffy layer to the top of the quilt, adding extra texture and loft. Trapunto quilting is created using an extra lining that is hidden inside the quilt. The embroidery is sewn over the quilt top and stuffing is placed between the embroidery and the underlining to create the added padding on the quilt top. Watersoluble- Watersoluble may refer to a type of marking pen that can be used to draw seam lines or patterns onto a quilt but will wash away when the quilt is finished. Watersoluble may also refer to a stabilizing sheet that can be attached to quilt blocks during piecing and washed away once the block or quilt top is assembled. Wholecloth- Wholecloth quilts are created by sandwiching a solid quilt top, batting, and backing together as opposed to a patchwork quilt top. A wholecloth quilt can be made from a special fabric or to showcase free-motion or Trapunto sewing techniques. Wholecloth quilts are often used as bedquilts. Wideback- Widebacks are extra-large cuts of fabric used for quilt backings. Using a wideback allows your quilt backing to be created from a single piece of fabric rather than having to seam several smaller pieces together. Prairie Points- Prairie points are a decorative border added to a quilt, sewn from triangular piecesof fabric, usually overlapping each other, with the points facing out from the binding of the quilt. Width of Fabric- (WOF) The width of the fabric is the measurement taken from selvedge edge to selvedge edge. The selvedge edge is the finished edge of the fabric when it comes off the bolt. Hand Dyes- Hand dyed fabrics for quilting are dyed in smaller batches than industrial produced fabrics, usually resulting in richer colors and more tonal gradation. Hand dyed fabric can be created from PFD material. Fat Sixteenth- A fat sixteenth is a piece of fabric measuring approximately 9"x11". Fat sixteenths are relatively small cuts of fabric and are a good way to sample fabric collections and create a stash for a scrap or charm quilt.